The big Vice Presidential Debate is tonight, with Republican Mike Pence going up against Democrat Tim Kaine (or, if you can’t remember their names, Race Bannon from Johnny Quest and the one who looks like a sitcom dad). 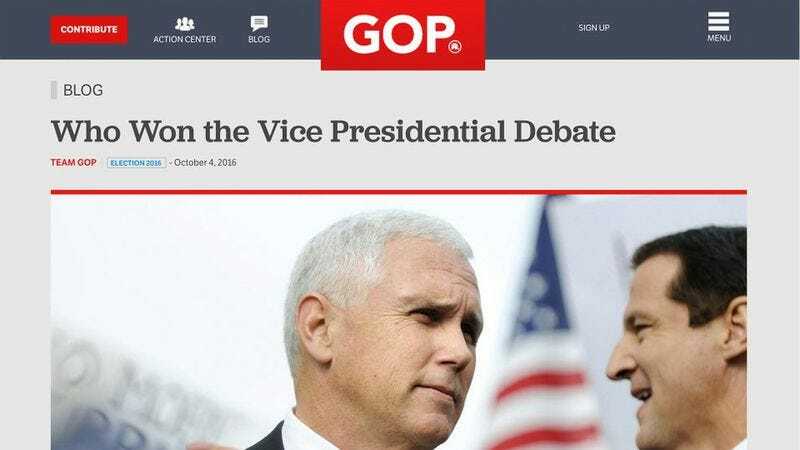 It promises to be an intense evening, with Pence and Kaine most likely sticking to the actual issues the way real politicians do, instead of going on bizarre tangents about Rosie O’Donnell like one of the presidential candidates did at the last debate. Clearly, everybody in America who doesn’t have something better to do will surely be on the edge of their seat. Politics aside, the big lesson here is that there are very few things that internet people love more than pointing out others’ mistakes. It just so happens the mistake here is very big and happened to a major political party on the night of a very important debate. Whoops.